The public debate of climate change is often concentrated on the rise of the average temperature of Earth. Lately also the diminishing glaciers and sea ice on polar regions have gained attention. Snow is an equally important phenomenon of the cryosphere that has not yet gained as much weight as it should. Research scientist Matias Takala developed new and improved methods for Snow Clearance Day (melt-off day) and Snow Water Equivalent (SWE) monitoring in the Northern Hemisphere. The thesis work improves the reliability of satellite-based snow monitoring in particular in the boreal forest region by applying space borne microwave radiometer instruments. The work has resulted in Climate Data Records (CDRs) of snow clearance day and daily values of SWE. Data are available for the entire Northern Hemisphere covering more than three decades. The developed CDRs are relevant for climate research, for example concerning the modeling of Earth System processes. CDR on snow clearance day is used to map the CO2 balance between the biosphere and atmosphere in the case of boreal forests. Further, methodologies to assess snow mass in terms of SWE for hemispherical and regional scales have been developed. The work has also resulted in the establishment of new Near-Real-Time (NRT) satellite data services for hydrological end-use. In hydrology SWE data are used to enhance the performance of river discharge forecasts, which is highly important for hydropower industry and flood prevention activities. Hemispheric snow extent and snow mass are two important parameters affecting the water cycle, carbon cycle and the radiation balance in particular at the high latitudes. 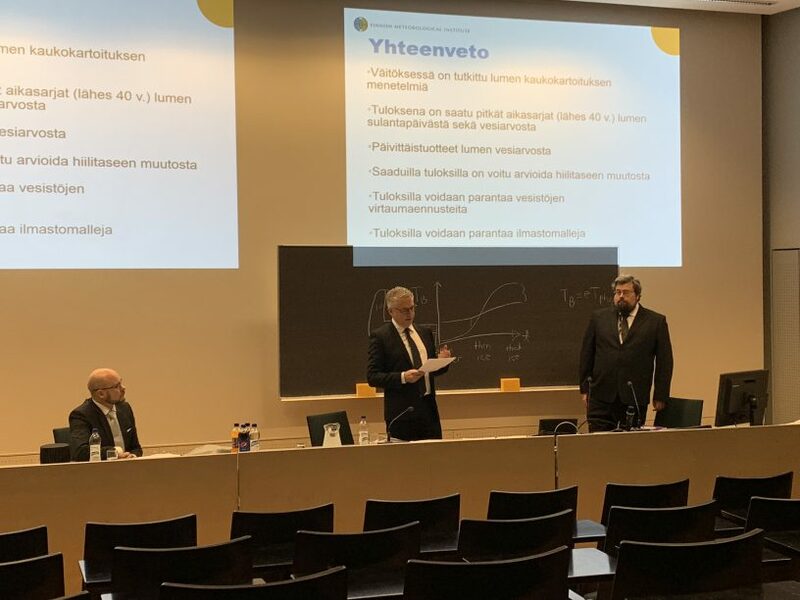 Matias Takala defended his doctoral thesis “Microwave remote sensing of snow and environment” in Aalto-university on 4th of December 2018. Professor Claude Duguay from University of Waterloo, Canada, was the opponent. Supervising professor was Jaan Praks from Aalto University, Department of Electronics and Nanoengineering, Finland.